There were several reasons to head down to the new Runners Roost store by the new Super Target in south Fort Collins. First, it was to celebrate its grand opening (it actually moved from Drake Rd. to the new Front Range Village shopping complex off Harmony). My neighbor Tim wanted to go and several other runner friends were going to be there as well. 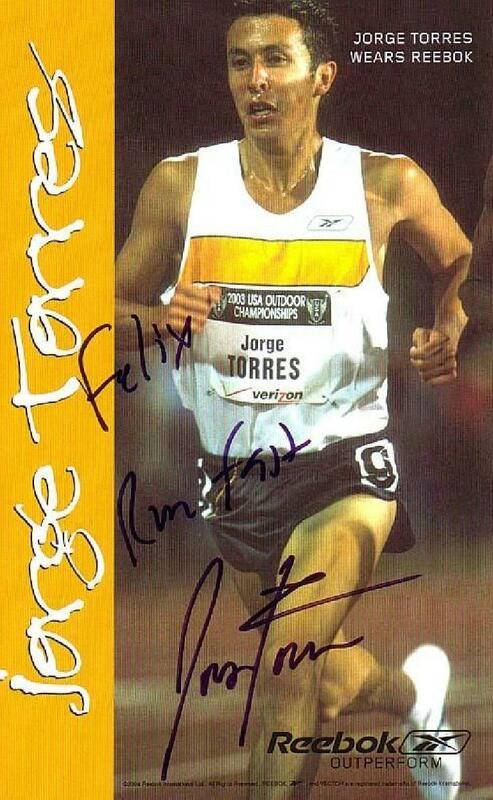 Plus, Jorge Torres —a professional runner who represented the United States in the 10,000 meters—was going to make a presentation. What more could one ask for? How about champagne and cookies! Then, shortly after coming back, Jorge gave a short talk. About half of the audience was the Latino Running Club whose young prospective members he was trying to inspire, but what he had to say interested the rest of us as well. He touched a little bit upon his training regimen when asked (>100 miles a week in season, though now it is after the Olympics, he’s running about 35), but mainly he stressed how important it was for him to write down specific goals (e.g., in middle school he wrote, “get into the 2008 Olympic Games”). Worked for me. Afterwards, he graciously signed autographs, including the one depicted above. Seems like the Wednesday evening runs will continue from the new Runners Roost despite the new location and the ever-decreasing daylight, so if you are interested in coming, contact Runners Roost.